(CNN) -- Orlando Magic beat Los Angeles Lakers 108-104 to win Game 3 of the NBA finals as Dwight Howard with 21 points and 14 rebounds led them to a homecourt victory on Tuesday night. 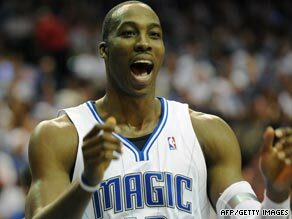 Dwight Howard scored 21 points and 14 rebounds as Orlando pulled a game back in the series. Magic trail 2-1 in the best-of-seven series ahead of Game 4 in Thursday in Orlando. Howard received fine support from Rafer Alston with 20 points and Rashard Lewis with 19, having an incredible 75 percent success rate in shooting from the floor in the first half. Magic had to be at their best as Kobe Bryant was at his imperious best for the Lakers with a game-high 31 points and 21 in the first half. They led by five points at halftime and 14 going into the final quarter, but Lakers chipped away at the lead and Bryant had a three-point effort with 22 seconds left that would have cut the gap to a single point. But his shot hit the rim and Magic could breath easy. The Lakers won the first game in Los Angeles by 25 points before winning 101-96 in overtime last Sunday.